Jacques Brunel has named the France side to take on England at Twickenham, with Mathieu Bastareaud returning to the midfield. Centres on both wings and a winger at fullback. Don’t forget that NTamack can play FH or CTR, and that Ramos plays both FH and FB in Toulouse. Also, Dupont and Parra can both play SH or FH. So there’s not too much to worry about in terms of FH. I would liken it to Slade CAN play 10, but would you want him as the back up to Farrell? Ramos and NTamack have one cap between them and no matter what the French think, a scrum half cannot suddenly just play flyhalf. None of the French replacement options are international fly halves (yet). It only takes Lopez going down ( via Lawes doing a trade mark tackle) and they could be in trouble. and now to watch the Lawes Plisson tackle to get excited for the match. Henno, maybe, but where are the ref & other officials from? Better hope they’re not Irish! Oh dear, Leon. Kidding. Make little diff methinks. Leon, that’s where EJ, coaches prior to the match & the captain on it, come in. If you know this as an astute observer, then they too ought to be aware of Owens’ proclivities. Maybe you could email HQ? That’s not a wind up BTW. It’s just a rhetorical ? Nevertheless, what you state makes sense! Foresight. Seb, whilst they “can”, and indeed, “have” played at 10, I think there would be plenty to worry French supporters if Ramos, Dupont or Parra ended up at FlyHalf in this game. That said, they can fill a hole in an emergency, so it gives them a bit more flexibility elsewhere. They just wouldn’t want one of them there for 75 minutes! A real case of taking the good with the bad here!. Huget at fullback! Fickou on the wing! Bastereuad at centre! No Fofana! These things fill me with hope. I think we’re in with a good chance and Slade must fancy playing opposite Bastereaud. I’d like to see them deal with Huget the same way they did with Henshaw, dragging him all over the place. Maybe it’ll be somewhere in between a blow out & a close 1? Personally, I too don’t like to see players out of position. As France are away & are likely to be up agin it, not least with the pen count, they could be asking for trouble with this hopscotch back line selection. 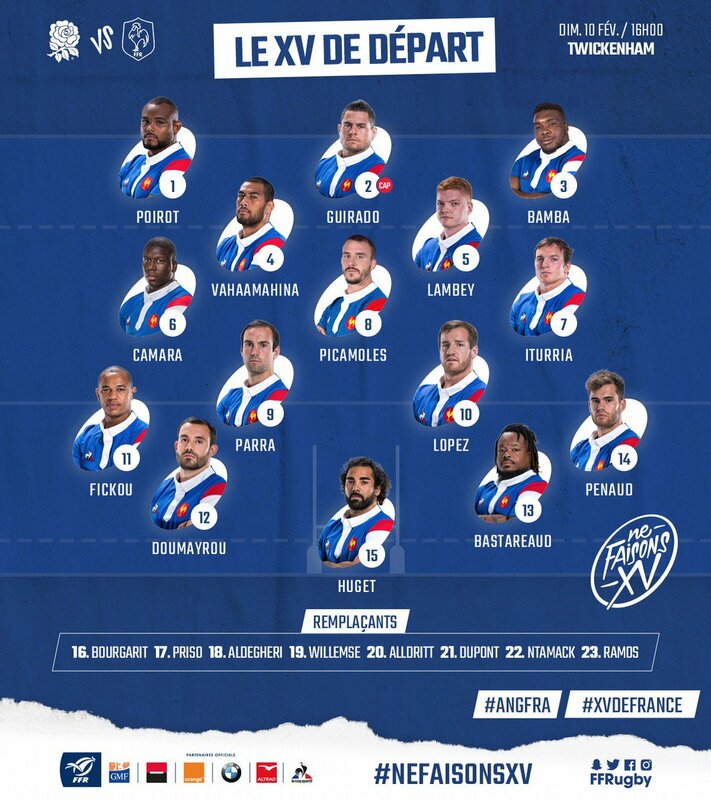 Also, the choice of Bastareaud seems retrograde. Is he just in for ballast v England? When they get ball, where’s the creativity? The real ? is, whether France will get enough possession? As Pab alludes to, in this, the breakdown will be crucial. If France don’t win this area, then they’ll likely lose. Even with parity or a bit more here, they’ll likely lose. Their backs will have to max every chance. Nor can they, or their fwds for that matter, make errors or give pens away. Just can’t see this happening, so they’ll likely lose. Of course the set piece is another matter. France may compete here. We’ll have to see. Dunno about their reserves. Apart from the French, Teresa may the only English person with her fingers xxed for their team. I’m always wary of France – they seem capable of raising their game for the English. I can recall that game where Fickou scored in the dying moments to ruin a grand-slam championship on the opening weekend, the 2018 game and that close 2017 game also at Twickenham. Bastereaud gets a lot of stick but he’s a fantastic defensive player – so hard to shift at the breakdown. If England send unsupported runners through the midfield he’ll win penalties all day long. That back row is going to cause problems and Lambey looked solid coming on last week. Looks a much better side. The weaknesses could be the defensive positioning of the back three, and so I expect a good kicking game to exploit this. Its a fascinating team; Penaud and Doumayrou are very good players. Fickou can be hit and miss, but he did look sharp against Wales. Huget at FullBack? Bastareaud – who knows what he will do? Well, we know what he will do, but how effective will he be? The back row with Camara looks more balanced. Damba looks very good with ball in hand, but I though he struggled a bit in the scrum last week. Thought Lambey looked good when he came on too. Him and Fickou were the only players to do much in the second half. One suspects that they will play with very little structure, with Parra reigning them back in, from time to time. 76 queries in 0.664 seconds.